The FTSE All-Share trades within barely 10% of an all-time high that it set in Spring 2018 but investors might not guess as much, given the prevailing confusion over the Brexit talks, a fragile Government and dire warnings over the economy from the Bank of England and its Governor Mark Carney. Sterling has acted as the main Brexit shock absorber so far and its weakness has helped to support the economy, corporate earnings and lure predators to UK stocks, even if the wisdom of actively seeking a weak currency over the long term is dubious at best. A still-lowly base rate, a 1.33% benchmark Gilt yield and a 4%-plus dividend yield on the FTSE 100 all form part of the case for UK equities. 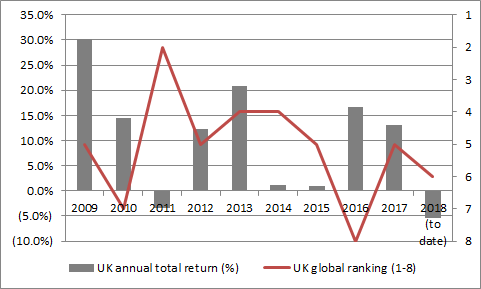 But not everyone is convinced, given how the UK underperformed relative to its global regional peers in 2018, the ninth time in 10 years that it has done so. That shocking record will please those investors who have had the foresight to diversify via overseas equity (or even fixed-income or property) holdings. But it also begs the question of what needs to change to return UK stocks to favour, although a bumper year for merger and acquisition activity suggests that corporations and trade buyers think there is already value to be had. Visibility on Brexit may be the key but what form and shape any deal takes – assuming there is one – remains difficult, if not impossible, to divine, even with a relatively short space of time to go before March 2019, or even the end of the proposed transition phase in December 2020. Brexit dominates here and at the time of writing, the potential outcome of the UK’s invocation of Article 50 and its planned withdrawal from the EU on 29 March 2019 remains entirely unclear, in terms of how it will look and what it might mean. The proposed transition period could be extended until 31 December 2022 to give businesses and individuals more time to adjust for when the new post-Brexit rules apply. Free movement can continue during this period and the UK can strike fresh trade deals, although they will not come into force until after the end of any transition period. But any failure to reach a deal by March could scupper the transition period, which may be why UK financial markets remain wary of the ‘no deal’ option, simply because they do not know where it may lead. And for the moment, sterling is the markets’ prime tool for expressing their views. Usually markets would express their satisfaction or discontent with a nation’s economic prospects through the bond market, charging it less or more to borrow. But the Bank of England’s QE scheme rules out that, given the Old Lady of Threadneedle Street’s £435 billion in Gilt holdings, so sterling is being used as a lightning conductor instead. 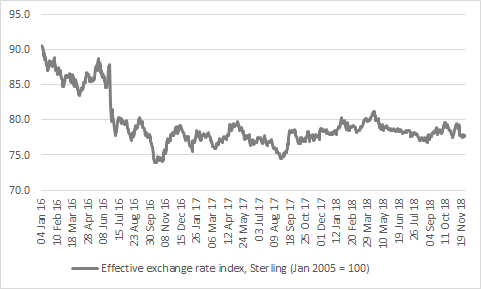 A Bank of England trade-weighted sterling basket shows that the pound, at the time of publication, trades above its October 2016 lows but 14% below the level at which it began that year. Writing about elections in the UK in 2019 is fraught with risk given the febrile nature of British politics. There remains the possibility that Conservative Party leader and Prime Minister Theresa May could face a leadership challenge or even choose to step down immediately after Brexit day, according to some reports. The Liberal Democrats’ Vince Cable is to step down as party leader once, to use his words, Brexit is “resolved or stopped” and Labour’s Jeremy Corbyn is still far from popular with all of his MPs or party members, despite the way in which the Momentum movement continues to comprehensively shape policy. One of the very few things that is certain about British politics right now is that local elections will take place in the UK on 2 May 2019. Five mayors will be elected. Labour currently controls Leicester and Middlesbrough, the LibDems run Bedford, and Copeland and Mansfield are both currently in the hands of independents. In 2018’s local polls, Labour emerged as the winner. Jeremy Corbyn’s party took an extra 8% of the vote and added 79 councillors to its haul, while Theresa May’s Tories dropped three percentage points, losing control of three councils and 35 councillors in the process. Vince Cable’s LibDems gained four councils and 76 councillors as UKIP came off worst, losing all but three of its 126 councillors. Whatever the political views of investors when it comes to Brexit, the facts of the matter are that the UK economy has yet to drop into a hole, despite the ongoing confusion over what will be the ultimate outcome of the June 2016 EU referendum. Purchasing managers’ indices (PMIs) suggest that corporate confidence is holding up relatively well. 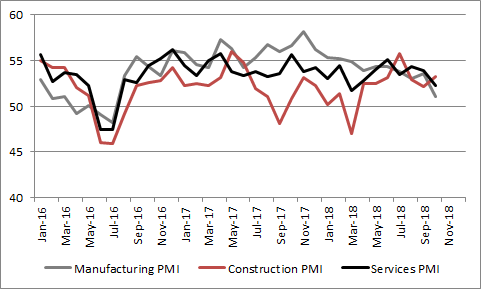 The manufacturing, construction and services indicators are still coming in above 50, although construction dipped below this mark when the ‘Beast from the East’ brought snow and freezing conditions in spring 2018 and all three readings began to slide again in autumn. Generally a reading above 50 is indicative of future growth, one below 50 of a potential slowdown or even recession. 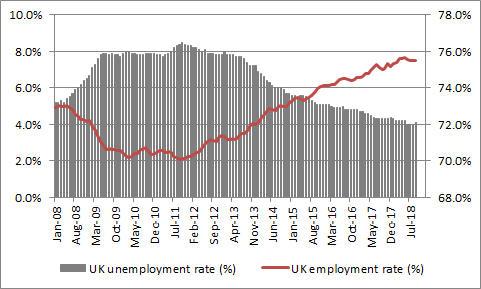 Meanwhile, unemployment has crept down to a near-four-decade low of 4.1% and the employment rate for 18-to-64-year-olds to 75.5%, virtually the highest figure since records began in 1971. 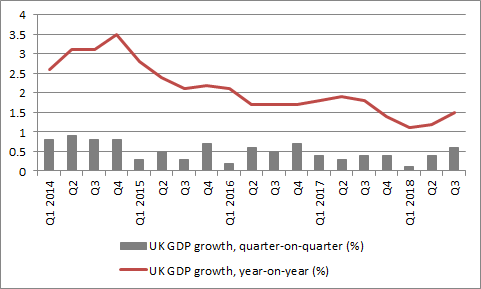 Relatively resilient retail sales and industrial production numbers have also helped to ensure that the headline GDP growth numbers have held up at respectable, if far from exciting, levels in a range between 1.5% and 2.0% year-on-year. Yet one of the reasons for this resilience is perhaps one upon which it would be unwise to rely too heavily. The economy did not drop in a hole because the currency did. Sterling has lost 12% of its value on a trade-weighted basis since the referendum vote and it has done so despite two interest rate increases to 0.75% from the Bank of England, the Monetary Policy Committee and Governor Mark Carney. A move in inflation above the Bank of England’s 2% target eventually forced the hand of the Monetary Policy Committee as sterling fell, the oil price rose and wages slowly moved higher – although the modest pace of salary increases remains a conundrum, given the lowly prevailing level of unemployment. 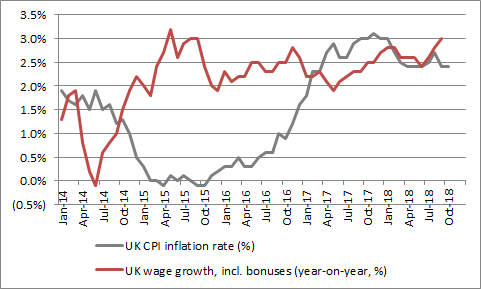 If wage growth really does start to pick up then the Bank of England may need to get a wiggle on, although Governor Carney and his colleagues are clearly determined to proceed at a modest pace at most, given the uncertainty posed by Brexit and the central bank’s concerns over what the ‘hard’ or ‘no deal’ scenarios could bring. In the short term Brexit, and whatever form it takes, is likely to shape sentiment toward UK assets. In 2018 the UK, as benchmarked by the FTSE All-Share, ranked just sixth out of the eight regions covered by this document. In total return, sterling terms British equities outperformed only Asia and the Africa/Middle East region, trailing behind America, Japan, Eastern Europe, Latin America and Western Europe. That represents the seventh year in a row when the UK ranked no better than fourth, a truly dismal effort which also means it has come in the top three just once since 2007 (and that was in 2010). Another good sign, besides the prevailing calm, is that analysts’ consensus forecasts, in aggregate, for the FTSE 100 continue to forecast earnings growth for 2019. Better still, estimates for both profits and dividends continue to rise. A further support to UK stocks comes from the dividend yield they offer to investors. Based on aggregate consensus estimates for 2019, the FTSE 100 offers a yield of 4.8%. 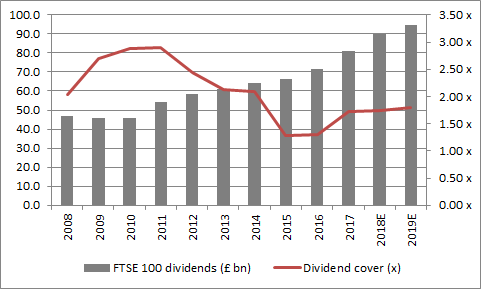 That figure easily beats anything that can be obtained from (developed market) Government bonds and is based upon the assumption that total dividend payments grow by around 5% in 2019 to a new all-time high of £95.7 billion. Equally encouragingly, earnings cover for dividends is seen reaching 1.8 times. This is, in truth, below the 2.0-times threshold that would provide real comfort, and a cushion against any unforeseen economic and earnings setback, but it still represents a massive improvement on the lowly 1.25 cover available in 2015 – a year that preceded the multiple dividend cuts of 2016. Consensus analysts’ forecasts, aggregated from the bottom up, put the FTSE 100 on a forward price/earnings (PE) ratio of just 11.6 times for 2019. That is cheaper than the US on 15 times, Europe on 12.5 times and Japan on 12.1 times, using Morgan Stanley estimates for those regions, and not much more than 10.5 times rating afforded to Emerging Markets. Sceptics would argue that Brexit and a heavy reliance on banks, oils, miners and insurance companies for profits and dividend mean the lowly rating is deserved. But the fat yield, lowly value of the pound and modest PE ratio could explain why the UK is seeing substantial levels of merger and acquisition activity (despite Brexit concerns). Of the firms who started the year in the flagship FTSE 100 index, GKN and Sky have received successful bids, Shire is in the process of being bought by Takeda of Japan and Smurfit Kappa has had to fend off an American approach. In addition, Sainsbury is looking to merger with Asda, Vodafone has acquired Liberty’s European cable networks in an €18 billion deal and now Randgold is looking to merge with Barrick Gold. Finally, Old Mutual is breaking itself up, Prudential is demerging M&G and SSE plans to demerge its retail energy supply business. That is ten firms involved in huge transactions. The last year to be this busy was 2007, when Corus, Gallaher, Scottish Power, Alliance Boots, Hanson and ICI were all acquired. Some investors may view this as a good thing – since acquisitions provide shareholders with cash which they can reinvest – and some a bad, since 2007 called the top of the market in spectacular style.